During the month of March, Scientologists around the globe celebrate the birth of their founder L. Ron Hubbard. This year marks his 101st birthday and the release of a brand new encyclopedic biography. This past weekend, the Nashville Church of Scientology held a celebration of its founder’s 101st birthday with a day of festivities. Parishioners saw a video presentation during which the ecclesiastical leader of the Church of Scientology released a monumental, 16-volume biographical encyclopedia, The L. Ron Hubbard Series. In total, the work is comprised of more than 3,600 pages. 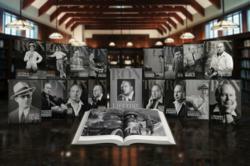 The first volume in the series is L. Ron Hubbard: A Profile, which serves as an overview of his life and journey. Successive volumes demonstrate his mastery of myriad professions, including Writer, Adventurer, Composer, Explorer, Poet, Master Mariner, Educator, Horticulturist, Photographer, Humanitarian, and of course Philosopher and Founder of the Church of Scientology. The entire series is richly illustrated with more than 1,000 photographs from the L. Ron Hubbard archives—including images of Mr. Hubbard as well as those taken by him. Hundreds of photographs presented were never previously published for the fact that many date back as far as a century and had naturally deteriorated over time. Due to deterioration, the photographs throughout The L. Ron Hubbard Series required a massive restoration project. The process involved digitally scanning century-old photographs and negatives at resolutions even beyond those employed by the Library of Congress and the National Archives. Teams of specialists then meticulously restored every photograph pixel by pixel, removing dust, scratches, cracks and other imperfections. In all, the task demanded better than 10,000 man hours to complete. The resultant restored photographs, otherwise lost, are now presented for the first time in extraordinary clarity and detail in an exclusive companion book entitled Images of a Lifetime. This 400-page, large format volume is a photographic biography, portraying the intimate story of Mr. Hubbard’s life through more than 500 images, each with accompanying detailed captions. The Nashville Church of Scientology is making these books available to anyone who wishes to see them with a permanent display just outside their chapel. Anyone wishing to learn about Mr. Hubbard is welcome to visit the church between the hours of 9am-9pm, to see these materials and the church’s public information center. For more information, go to http://www.lronhubbard.org.